Home prices were consistently up again in most markets in 2018, though at reduced levels compared to other recent years. A high demand for a low inventory of homes fueled price increases in most markets across the island. Last month new listings decreased by 16% for single family homes and by 1.7% for condos. Closing out 2018 median home prices increased 3.4% to $708K for single family homes and by 14% to $493.5K for condos. Months inventory decreased by 8% for homes and dropped 22% for condos. Evidence is mounting that inventory will improve in 2019, the Fed has indicated that the number of rate increases this year will be halved. Unemployment rates remain low and wages continue to improve in many U.S. households. Below is a chart from Fidelity National Title showing Year End 2018 statistics on Maui versus 2017. P.S. - Maui's new law known as the "Styrofoam ban" was enacted December 31, 2018 and outlaws polystyrene containers. Malama Eco Products has launched a business division to help local business owners to comply with the new laws and become more eco-friendly. A Maui tropical retreat. This private Maui Meadows home and cottage sits on over a half acre that is surrounded by lush gardens, tropical flowers, fruit trees, pathways and water features. The main home is a 4 bed, 3 bath with 2 master suites both with separate entrances and a finished basement studio. Gorgeous home ideally located in popular Wailea Kai for easy Keawakapu Beach access. Sought after cul-de-sac location. This spacious and private 4 bed, 3 bath residence beautifully incorporates the flow of the home into one of the largest yards in the neighborhood. $1.65M (FS) A once in a lifetime opportunity to acquire a part of Maui's rich history. 9.192 gently rolling acres, privately situated off Kekaulike Road and surrounded by over 3,276 acres of ranchland. Surround your senses with quiet and cool verdant fields of Upcountry Maui. You will absolutely fall in love with this vintage, updated 3 bed, 1.5 bath home. 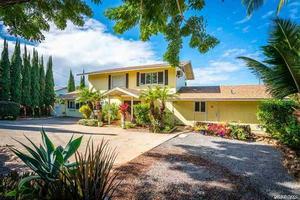 Located 30 minutes Northeast from Makawao is your new country home in Kailua. Bank Owned - Oceanfront Paukakalo. Great opportunity to be right next to the surf spot known as "big Lefts". The home does need rehab, but the location is amazing. The current configuration is an upstairs 3 bed, 1 bath with a loft and a downstairs 2 bed, 1 bath. 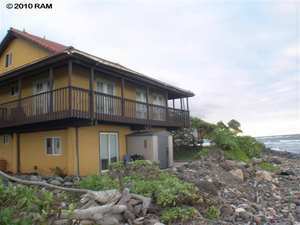 Short Sale - This 3 bed, 2.5 bath home located in Waiehu Heights. Just a few minutes away from a park, beaches, grocery stores and all that Central Maui has to offer. Living area has vaulted open beam ceilings, kitchen has been upgraded in the past. Wood laminate flooring. Don't miss out on this attractive 3 bed, 2 bath home on Pelenaka Place off of Kealaloa Avenue in Makawao. Large fenced yard, potential ocean views, and located in a nice neighborhood. $925K (FS) Subject property is located in the older section of Wahikuli. There are 4 rentals: 1) 3 bedm, 2 bath main dwelling. 2) 2 bed, 1 bath attached cottage. 3) studio, 1 bath. and 4) studio , 1 bath. The main house has a large open deck with ocean views towards the island of Lanai. The lot size is 13,823 sf. Built in 1969 and used for rentals, there is a need for major maintenance and clean up. Unit 139-1 is a beautiful 2 bed, 2 bath townhome in Puamana featuring; extensive renovations, custom finishes and top rental returns. Upgrades include; two custom bathrooms, completely remodeled kitchen, shiplap siding, wine bar, extra outdoor storage lockers, expansive loft bedroom, spacious outdoor lanai with hand crafted furnishings, new quiet dual pane windows throughout and high efficiency ductless air conditioning. $1.235M (FS) Well cared for and beautifully upgraded 1 bed, 2 bath condominium. Located on the inner courtyard of Tower II, unit 370 was upgraded in 2016 with granite counter tops, stainless steel appliances, tile flooring, carpet, and custom tile showers. Top of the world views from this exceptional location at Sugar Beach Resort. This remodeled 2 bed, 2 bath unit is refreshingly light and bright. Located one off the front row, the view down the South shore is expansive while being sheltered from the direct afternoon sun. Light Pergo floors throughout the living area welcome you and take the eye directly out to the view. Experience the exceptional from this 3 bed, 3.5 bath home. The entrance to Villa E102 sets a welcoming stage, e Komo Mai, and draws one in to the spacious and light great room. Its’ contemporary coastal comfort blends with the tropical landscaping leaving no doubt that you are in a special place, the epitome of indoor/ outdoor living. Royal Kahana studio 605 faces North towards Molokai looking out at the blue Pacific Ocean. Relax on the Lanai and enjoy the spectacular views while sipping your favorite tropical drink. The Royal Kahana Resort boasts a beautiful ocean front location. This studio unit is fully furnished, air conditioned, washer and dryer and a popular rental. $350K (FS) Only 150 steps to the beach where you an watch the sunset and whales. This charming penthouse unit is situated away from Kihei Rd, the complex is oceanfront and short term rental 30 day minimum is allowed. Close to the county tennis courts. In-ground pool is heated. Expansive direct view of the ocean and islands of Lanai and Molokai. Superb location for whale watching and only steps to the water. This 2nd floor condo allows privacy on your lanai and watching the magnificent Maui sunsets. Within easy walking distance to shopping and excellent restaurants at the Kahana Gateway Shopping Center. $488,888K (FS) Beautiful, spacious and fully remodeled 2 bed, 2 bath unit at Kahana Manor. Elegant gourmet kitchen with custom granite counter top and back-splash. Beautiful cabinets and extra pantry! Spacious bedrooms with updated baths. Hard to find open floor-plan with dining area and spacious living room combo to enjoy your day or a vacation time. Kihei $485K (FS) This 1 bed, 1 bath multi-use condo in the Island Surf boasts panoramic ocean views and a deck where gorgeous sunsets may be enjoyed nightly. The second floor location of this condo is accessible by two elevators and may be used for commercial office space, a residence, or as it is currently configured, a vacation rental condominium. $899K (FS) Palms at Wailea #1304 is a prime 1 bed 2 bath, ocean view unit in the sought-after central courtyard of this vacation rentable property. Furthermore, the unit’s layout is highly desired as it includes an added covered lanai space, effectively creating an additional room. This 1 bed, 2 bath second floor condo is carefully upgraded. Looking for stunning views of the ocean from almost every room? Look no further. This spacious 2 bed, 2 bath condo's views are incredible. Wake up in your master suite and slide open the large glass doors to enjoy your morning coffee on your large wrap around patio. This 2 bed, 2 bath upstairs suite offers panoramic views of the beautiful Pacific Ocean and neighboring islands. This Suite is located on the 9th Fairway of The Royal Kaanapali Golf Course overlooking the famous Kaanapali Beach. With only three steps to enter this unit makes it easier to access. Conveniently located in Central Maui, this breezy second floor, 1 bed, 1 bath unit is very clean, beautifully maintained and offers both vibrant ocean and mountain views. Clean carpet in bedroom, vinyl flooring in Great Room and Kitchen, upgraded kitchen and bathroom counter tops, modern lighting fixtures, glass beveled closet doors in bedroom and more. $269.9K (FS) Bank Owned - This Maui Lani Terraces unit is a preferred ground floor unit with peek-a-boo ocean views of neighboring islands. Walking distance to white-sandy beaches, parks, and shopping center. Be the one to unlock the hidden potential of this unit by stamping it with your own personal style. This 1 bed, 1 bath features a large living room area. $399,999 (FS) This rare 3 bed, 2 bath unit located at Kihei Shores offers the comfort and style of Maui living. The open living room floor plan includes new hard surface flooring with an outdoor lanai, and the spacious kitchen opens up to allow breakfast chairs along the high counter top. $390K (FS) 1.6 Acre CPR’d lot in Peahi Hui Subdivision is ready for you to build a home. The other portion of the CPR is not presently for sale and is being reserved for a future cottage. Check out this recently cleared lot with ocean views on one side and mountain views on the other. 5/8” County Water Meter, Underground Utilities, along with many new quality homes which have been built will insure that this is one of the premiere Ag subdivisions in Haiku.